Terrified at the sight of Titans? Well, having Mikasa Ackerman by your side drastically reduces your chances of marinating in some monster’s digestive juices. Her giant-slaying skills are peerless, and her loyalty to her friends runs deep. So it’s no wonder everybody loves her. 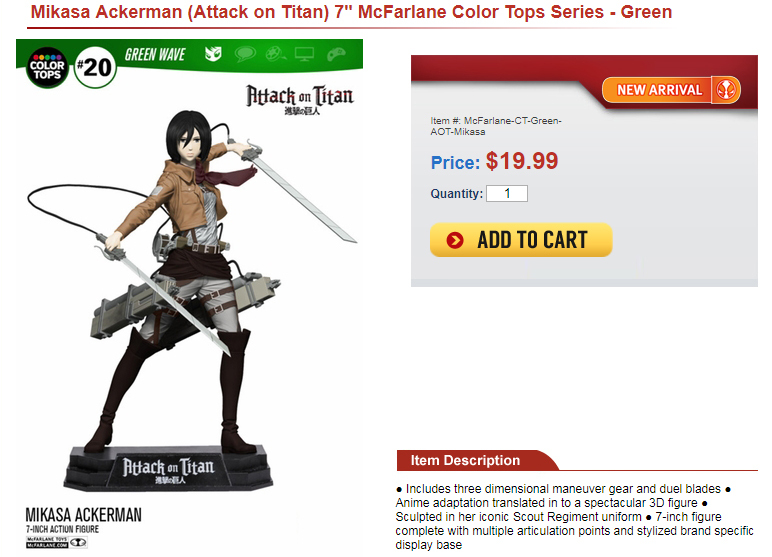 Bootleggers love her too, because to them, Mikasa – or anything Attack on Titan-related for that matter – equals money. 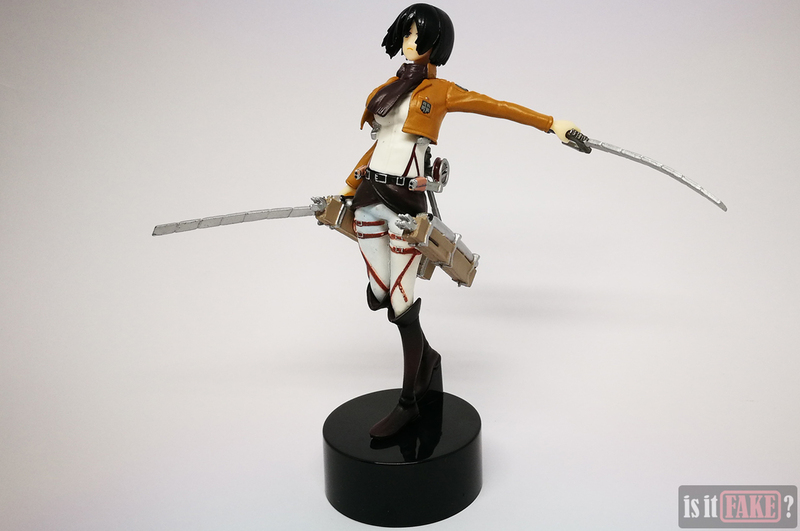 The demand for Attack on Titan figures remains high, and pirates are more than willing to provide, producing boatloads of fakes then selling them cheap. Well, it’s about time we wised up; fake items may not cost much, but what you get in return isn’t worth a cent. 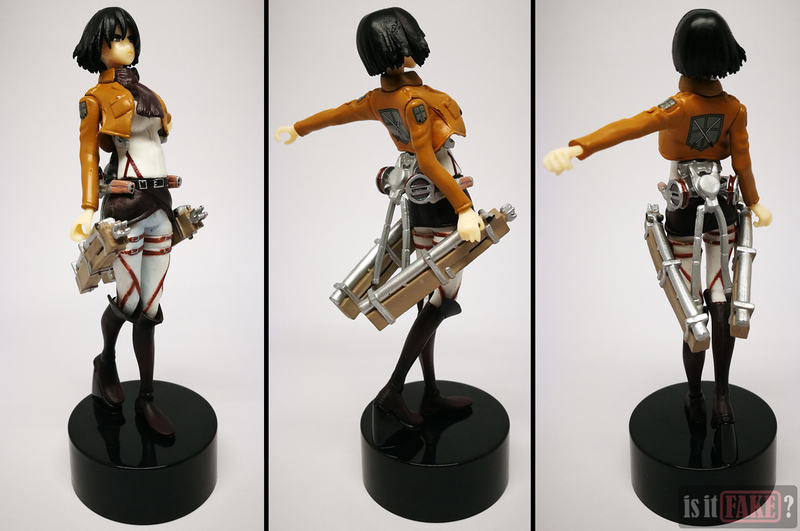 In fact, we recently acquired a counterfeit Attack on Titan Mikasa figure, and it’s hideous. If you’re looking for high quality original figures, you’d do well to stay away from Chinese online retail services like AliExpress. Many of these are piracy hot spots, where the possibility of being tricked into buying a fake is through the roof. Our Mikasa is a fake; it was obvious from the seller’s pictures alone. But the figure does come with a brand name: Peradix. 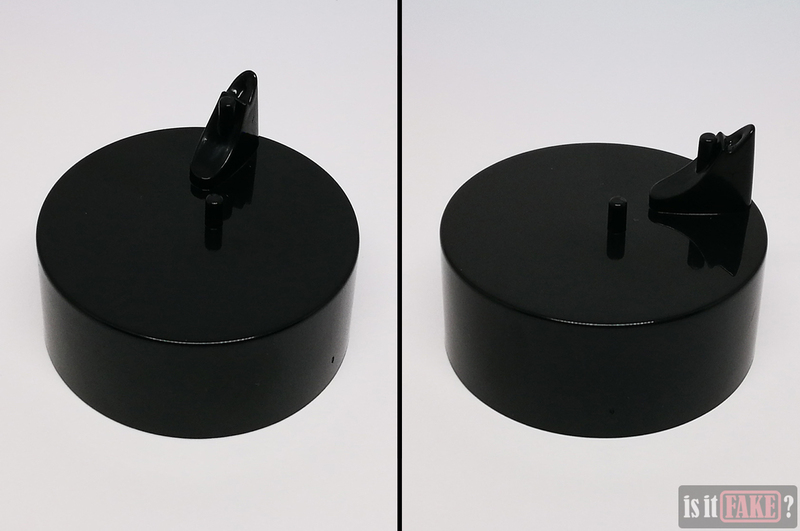 Research reveals Peradix is a manufacturer of children’s toys – not anime figures. It’s therefore possible the bootleggers simply used the Peradix name to make their fake seem legit. 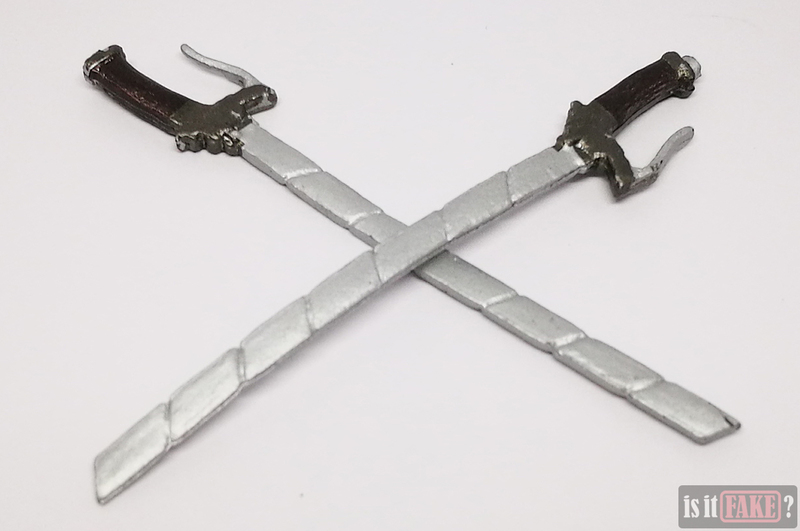 This is a tactic some pirates use – which is unfortunate, because not only does it raise the likelihood of the buyer getting manipulated into purchasing a counterfeit item, it also sullies the names of law-abiding companies. Here’s one rule of thumb to keep in mind – if an anime figure doesn’t come in a box, it’s either a secondhand item, or worse, a bootleg. 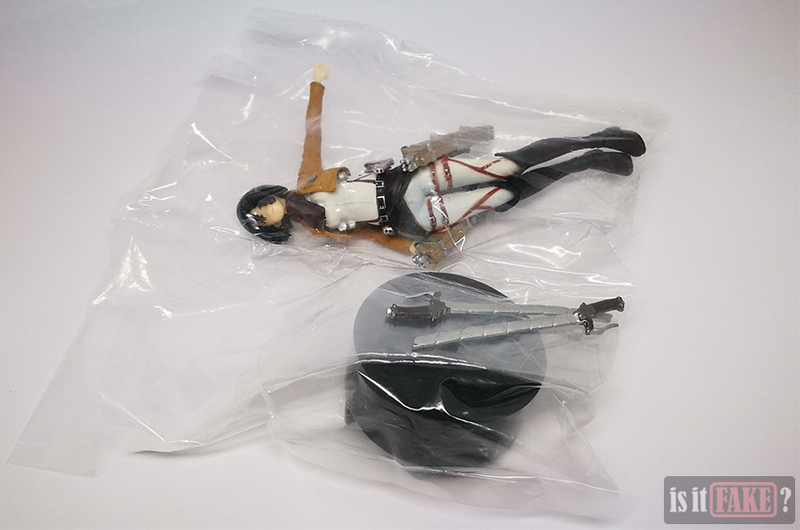 Case in point: the fake Mikasa figure we acquired wasn’t packaged in a box, but was delivered to us swathed in several layers of foam and transparent plastic. The first thing we noticed upon removing her from her plastic bag was how bendy she is. The video above says it all; her neck is so soft and rubbery you can wobble her head as if it were sitting on a loose ball joint. It wouldn’t take much force to twist or pull it off. Her arms and Vertical Maneuvering Equipment are just as flexible. Her legs are a tad stiffer, true. 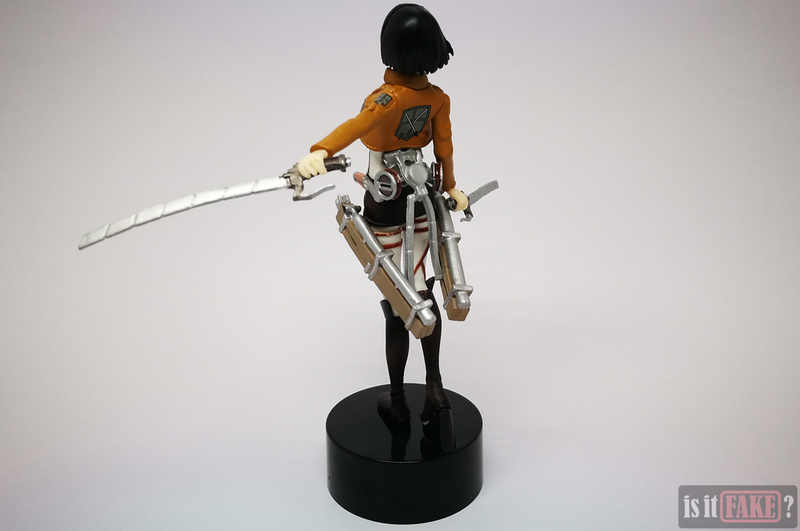 But as longtime collectors of Japanese figures, we’re confident time, gravity, and warm temperatures will gradually deform these legs and cause her to lean backwards. 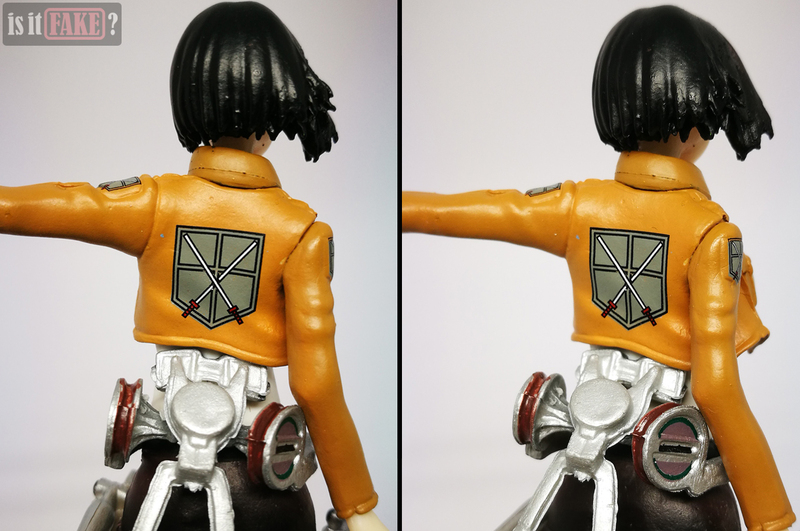 Fake Mikasa’s paint job comes with inaccuracies such as her jacket having a bit too much orange and her scarf being the same color as her skirt. But the most atrocious thing about the paint is how messy it is. There are blemishes everywhere, from her straps, to her pants, to her shirt and jacket, to her gear. Some details lack paint, while you’ll find colors spilling over from one detail to the next. The white areas are marked with dirty brown and grey blotches, as if Mikasa’s clothes haven’t seen the inside of a washing machine for weeks. The crotch area is especially filthy. 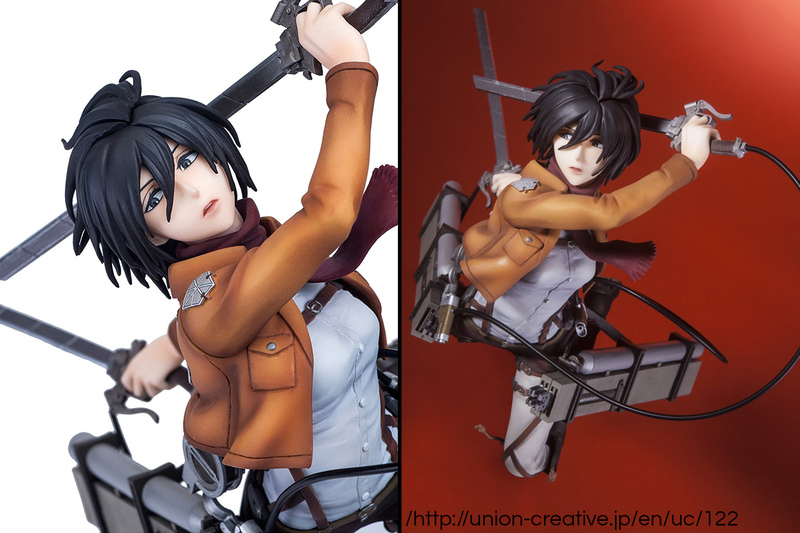 If you hold fake Mikasa a foot or more away from your face, you’ll be convinced she’s cross-eyed. Closer inspection reveals why: the inner corner of her left eye lacks white paint, so that it looks like her left eyeball is pointing inwards. 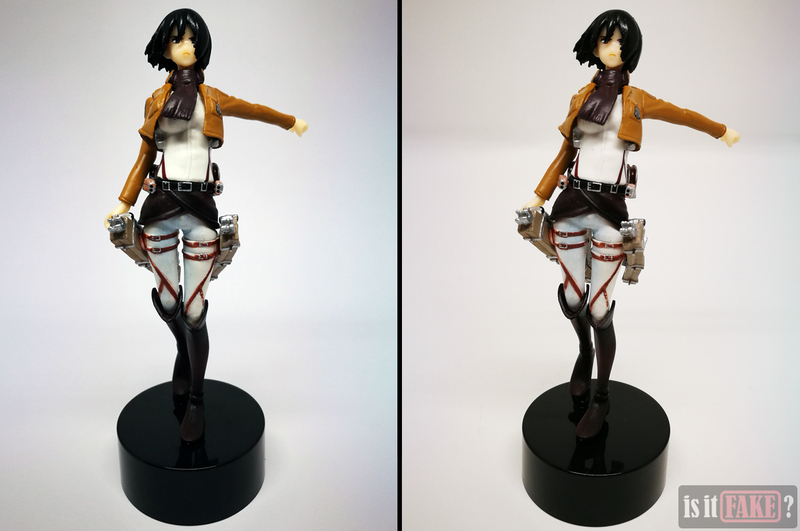 A better toy manufacturer would give a figure matte or glossy finishes where required, but fake Mikasa’s plastic is uniformly glossy. This makes for an odd look, as if Mikasa’s uniform is made entirely of leather, and her skin is slathered in sweat. The surface of the material also feels slightly sticky, so that touching Mikasa will leave your fingers feeling grimy. 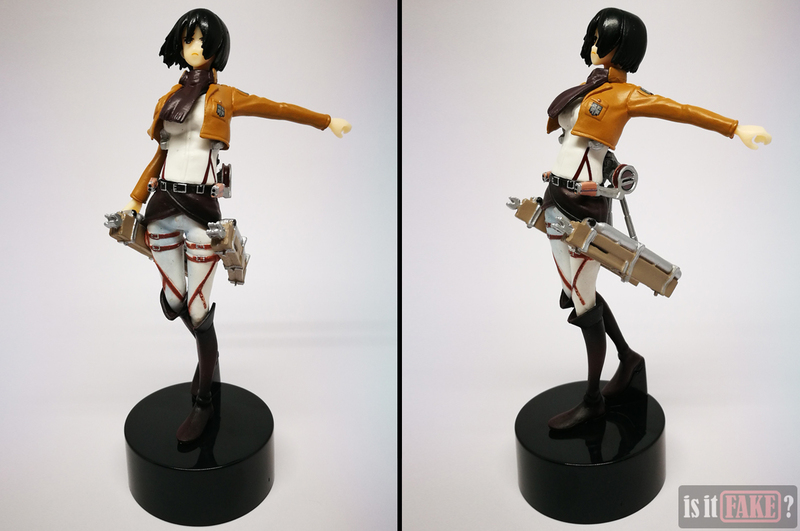 As we’ve dealt with similar toys in the past, we can also tell you now that this Mikasa figure is doomed to get only stickier and stickier. This is caused by the vaporization of the plasticizer mixed with the main material used to make the figure. Many new figures no longer become sticky because they’re manufactured using the latest techniques. 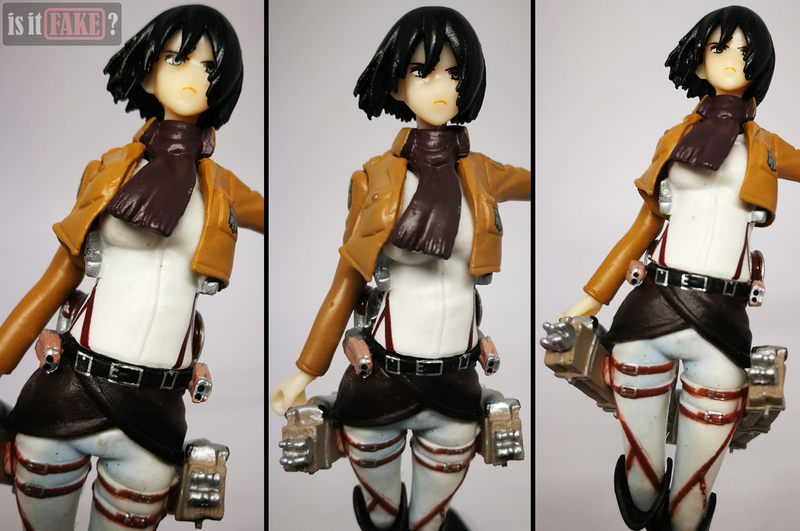 It’s possible a plasticizer was used in the creation of fake Mikasa because it’s an older, and therefore cheaper method of toy-making. Now let’s look at the accessories. The stand is light but sturdy. But it, too, is problematic. 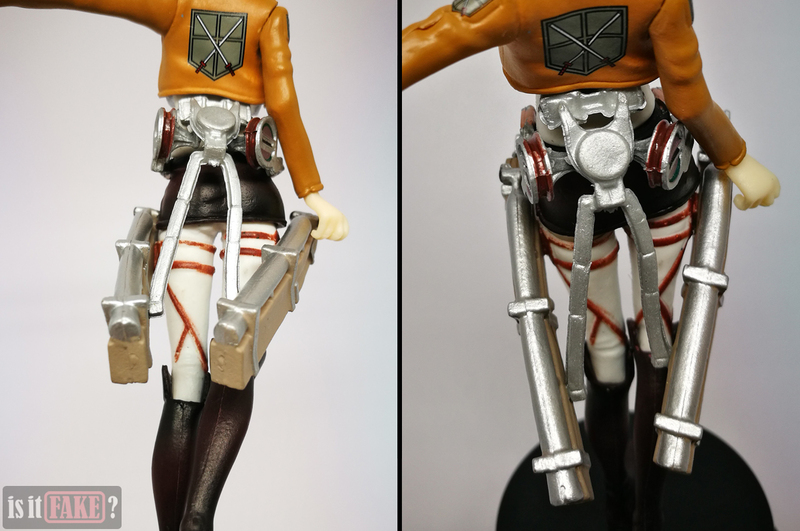 The peg closer to the center is too large to fit in the hole in fake Mikasa’s left foot. You’ll have to force her down if you want the peg to go all the way in, damaging the toy. 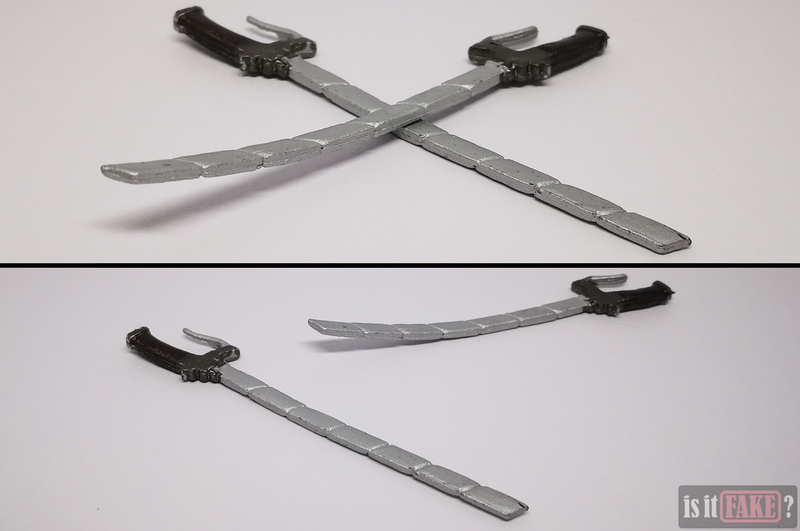 As for the swords, they’re even bendier than Mikasa herself. To straighten them out, we stacked them under a pile of books – all to no avail. They only stay straight for a couple of minutes before reverting to their original, curved state. 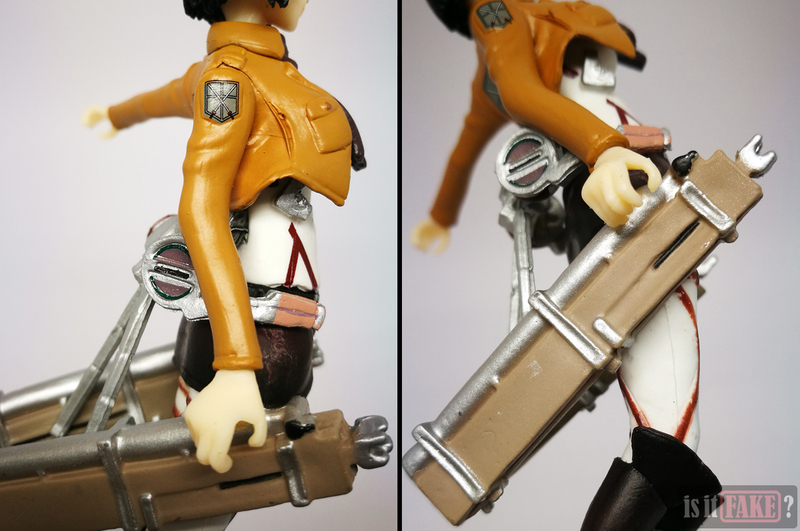 The swords don’t fit well in Mikasa’s hands. The lightest bump will send them flying out of her grip. Because of their curve, the swords just don’t look right in Mikasa’s hands. The positioning of her left arm – which is held lower than the original figure’s – also makes for an awkward pose. She should be holding her sword high as a show of confidence and strength. Fake Mikasa just looks tired. 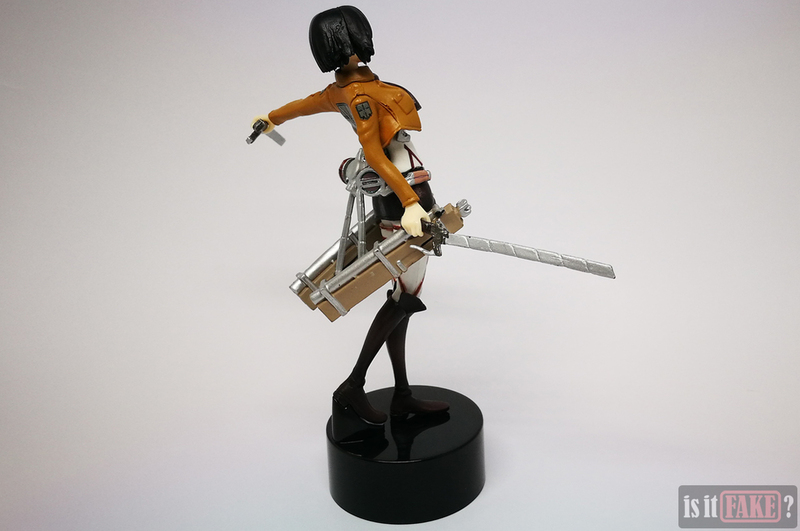 Fake Mikasa stands 125mm tall without the stand; with the stand, she’s 145mm tall. 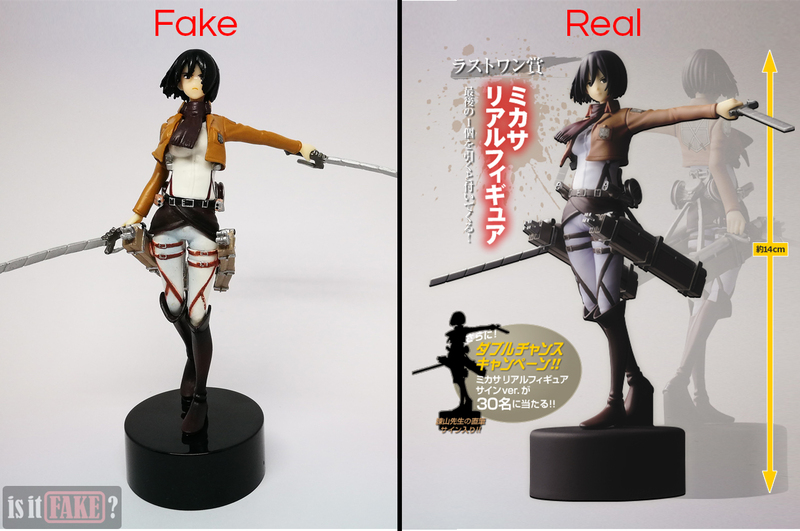 Fake Mikasa is based on a figure released by Banpresto way back in 2013. 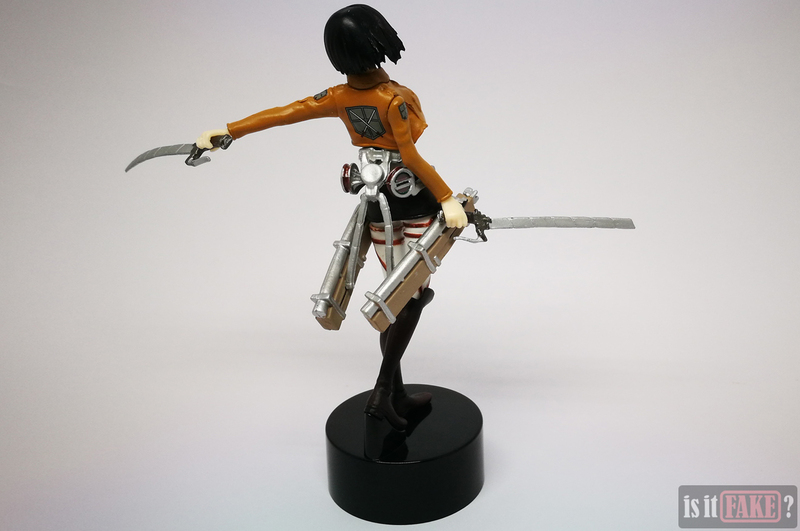 The original figure belonged to the Ichiban Kuji – Shingeki no Kyojin line, and was a toy that you won in lottery games. 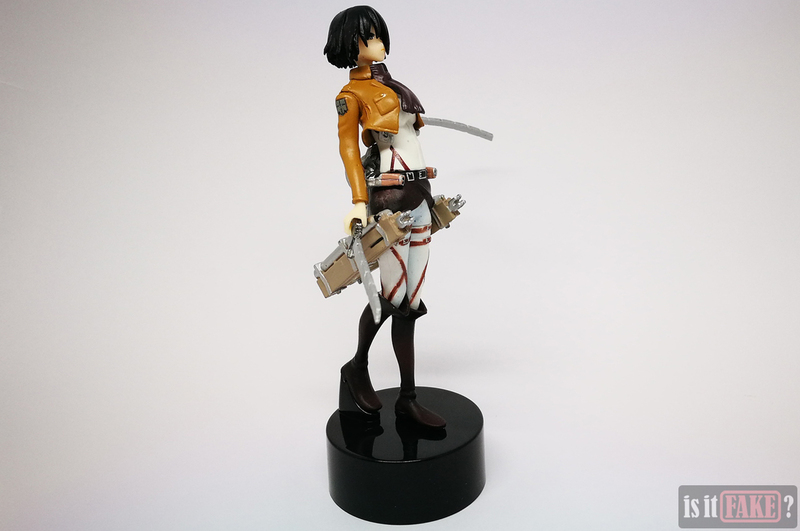 Unfortunately, Banpresto is no longer producing this particular Mikasa figure. 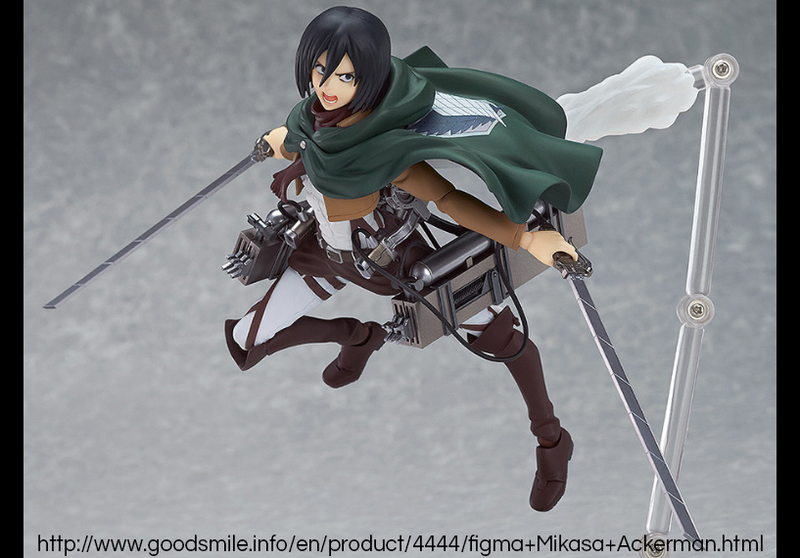 In fact, from their website, they no longer seem to be making Ichiban Kuji – Shingeki no Kyojin figures. 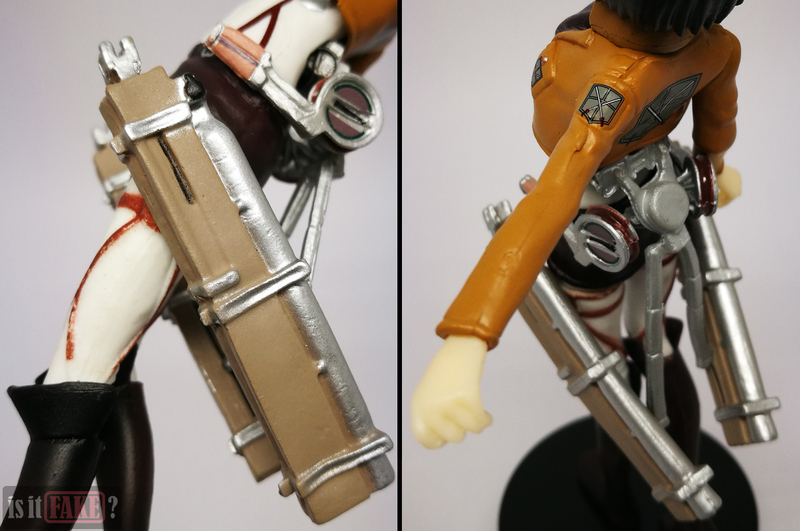 Thankfully, many companies are still making Attack on Titan figures. Banpresto is kind enough to provide a list of physical and online toy stores they approve of and that sell their products. 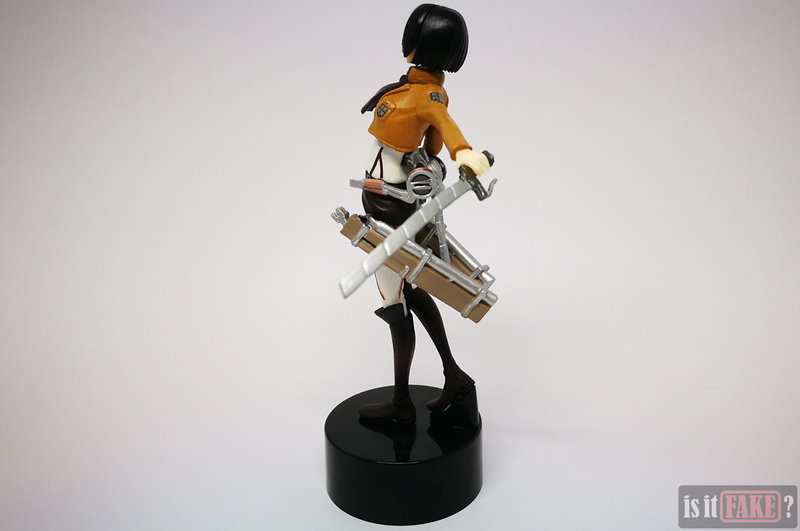 If you’re therefore searching for Attack on Titan figures by Banpresto or other manufacturers, feel free to start your search there. Just pick your country, visit the store’s official website, and start toy hunting! And if an item you’re looking for is currently out of stock, don’t fret – just request for a special order from the shop. The biggest, most popular shops are in constant communication with official toy manufacturers and distributors, so it’s possible they’ll be able to find you the figure you need. 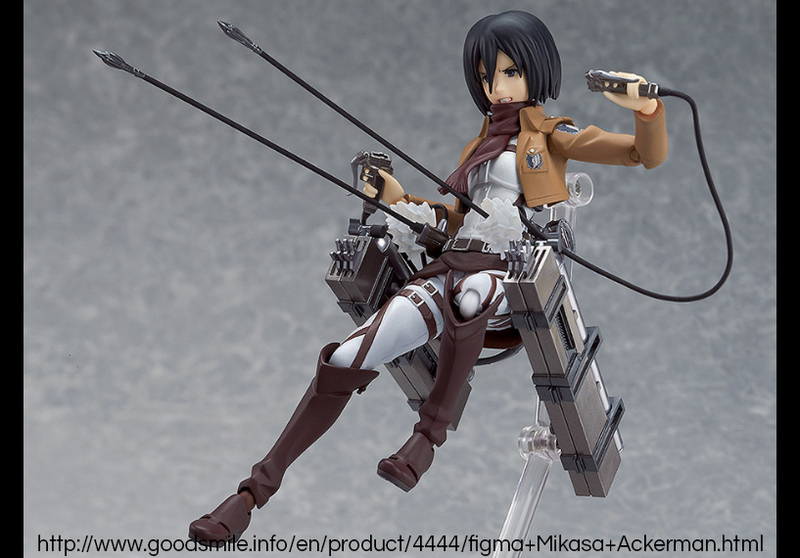 One really cool Mikasa figure to look out for is Figma 203 Mikasa Ackerman from Good Smile Company and Max Factory. This beautiful, fully poseable action figure boasts a show-accurate sculpt and paint job, comes with numerous accessories including extra hands and faces, and is made of high quality materials. She stands 145mm tall. Her cost varies per shop, but she is usually priced between $35 and $61. 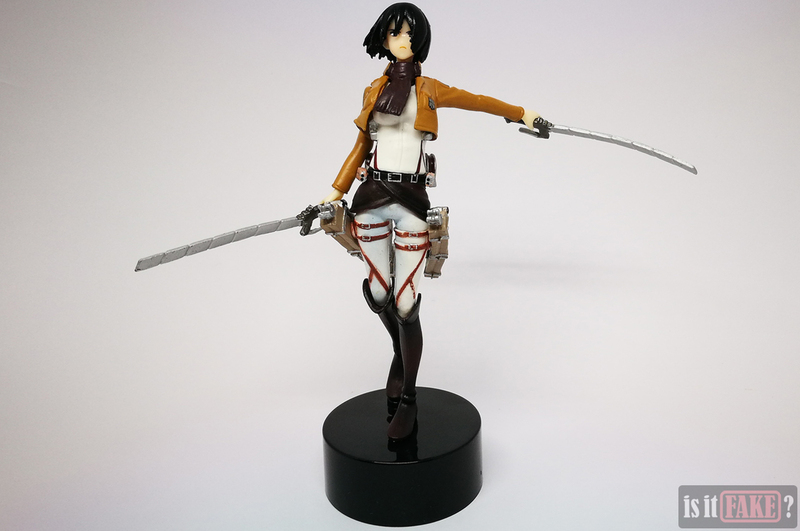 One of the cheaper Mikasa figures is the one from McFarlane Toys. This stands 7 inches, has limited articulation, and costs between $17 and $19. You can find her on Amazon and the McFarlane Toys Store. 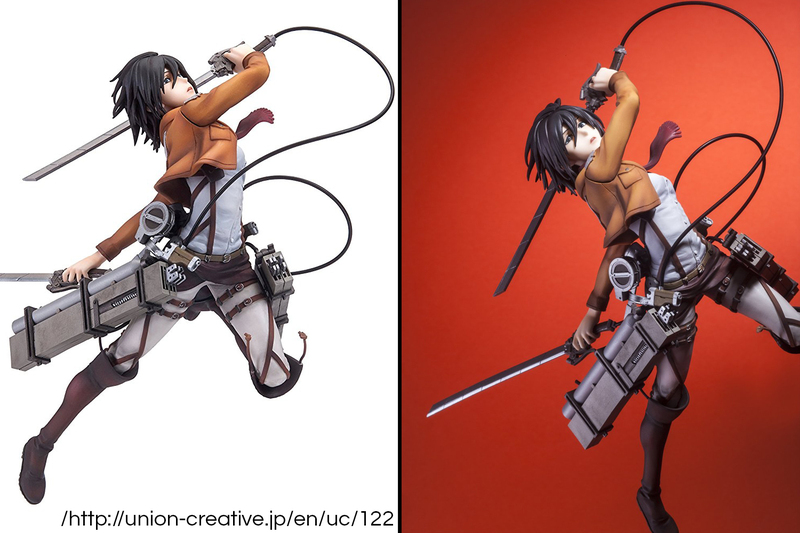 If you don’t mind spending a little more than that, there’s Union Creative’s Mikasa PVC statue. This absolutely gorgeous statue boasts an exciting pose and stands an impressive 8 inches tall. There exists two versions of this figure: the Research Corps version, which comes with a green cape, and the Training Corps version, which has no cape. The latter is available on Amazon for $91. 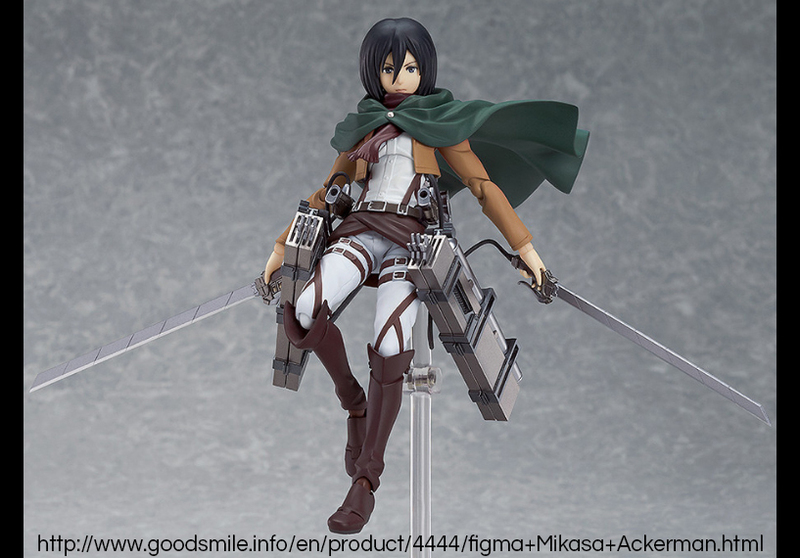 In addition to the three Mikasa figures discussed above, there are many more official ones to be found on Amazon. Most of them, however, are sold by third-party sellers. You must exercise extreme caution when buying from such sellers, as some are known to sell bootlegs. If you absolutely have no other choice, however, make sure you do some research on the seller first. Look at their rating, read their customer reviews, and if possible, ask around the internet if said seller is trustworthy. Only when you’ve amassed enough evidence to prove the seller 100% legit should you proceed with the purchase. Otherwise, look elsewhere. We’ve seen hundreds of Japanese figures in all our years of toy collecting. 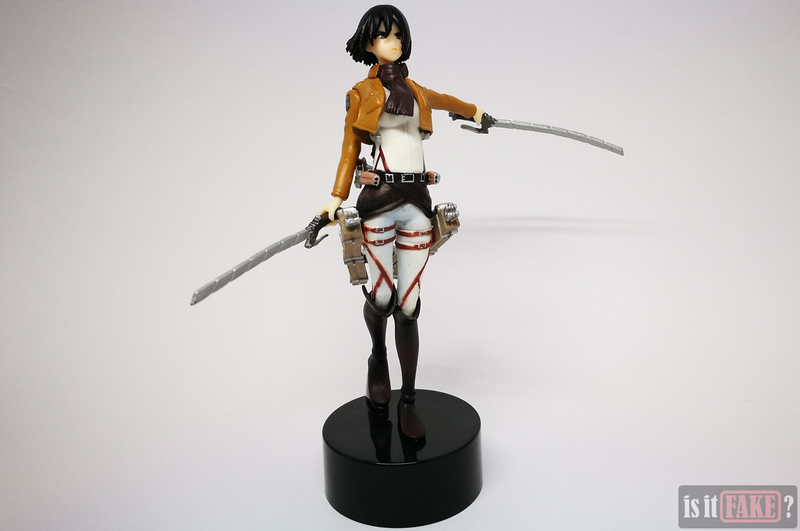 With her appalling paint job, unncessarily pliable plastic, curved swords, and sticky surface, this fake Attack on Titan Mikasa figure pales in comparison to even the worst of them. She gets a 90% terrible score.